Ninja Assassin delivers 325ppi monitoring functionality and the 7" size needed to truly master 4K, it's the only true 10-bit 4:2:2 professional recording solution for Apple, AVID & Adobe workflows and all with a price & weight amongst the lowest on the market – Ninja Assassin is available today from Atomos' extensive reseller network. Melbourne, Australia – 1st September 2015: In 2014, Atomos revolutionised the HD to 4K transition with the announcement of Shogun. Now, with their commitment to delivering powerful creativity weapons for professionals, they bring you the Ninja Assassin. 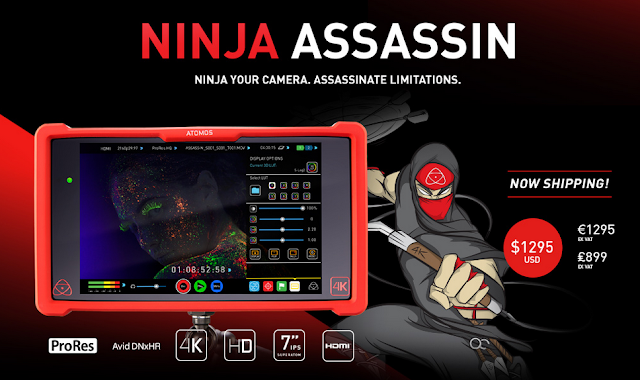 The Ninja Assassin extends the legacy of the Atomos Ninja line up in to the realms of 4K UHD and 1080 60p. Combining professional 4K/HD recording, 7" 1920x1080 monitoring, advanced playback and editing in a compact, lightweight, affordable add-on to existing DSLR, Mirrorless and Video, Cinema cameras. The Ninja Assassin boasts the screen size, screen resolution, advanced recording capability and scopes of the premium Shogun model, but forgoes the 12G/6G/3G-SDI connectivity, RAW recording functionality, in-built conversion, Genlock and balanced XLR audio connections. The main benefit – a 10% weight reduction to an incredible 430g and an incredible $1295 price point including Soft Case, SSD Caddy and AC Adaptor. This firmly targets 4K DSLM cameras such as the Sony a7s and a7RII, Canon XC-10 and Panasonic GH4 bypassing their known limitations such as compressed MPEG/h.264 recording, 4:2:0 color compression, 30-minute time limits and the disadvantage of monitoring on a small 3" screen. "The Ninja Assassin eliminates creative barriers and unleashes the true power of the worlds best sensors into the hands of creative pro's over one single HDMI cable. We are truly proud to deliver professional monitoring, video production tools and recording capabilities to assassinate camera limitations," said Jeromy Young, CEO and co-founder of Atomos. "Seeing an image on the Assassin's 7" screen and feeling the low weight is when you truly believe it's the only choice for 4K high-res production." added Young. • Record more accurate, higher resolution colors (4:2:2, 10-bit) direct to visually lossless editing formats (the only brand to do both ProRes and DNxHR). • No Record time limits – Recording externally to the camera puts an end to the traditional 30-minute recording barrier and allows larger media capacity. • Professional shot setup you can trust on a calibrated high resolution 7" monitor with over 320 pixels per inch. • Anamorphic de-squeeze, the perfect companion for Panasonic's GH4 and affordable Anamorphic lenses/adaptors. • Easy to use professional monitoring tools including Focus Peaking Assist, 1:1 & 2:1 Zoom with silky smooth image pan & scan, False Color (skin tones), Zebra and Waveform/Vector Scopes for in-depth image analysis. • Video Time-lapse with up to 10 different sequences, speed ramp and scheduled start and end times over 24 hrs. • 3D LUT's allow you to create a specific signature look or even recreate classic film stock instantly, with 50:50 split / LUT on / LUT off view, you can compare effects and make creative decisions on the fly. • Playback for instant review and editing on the fly with a choice of 10 tags in both record and playback mode. Our NLE support means that whether you are Mac, PC, Apple, Avid or Adobe we support you. A Ninja Assassin Product Sheet for the full range of specs and features will be available soon. I use both a7s and gh4 with this. Can not seem to get HFR output no matter how I work the settings. any tips or help? for a7s I realize it can only output at 60p/ 1080p thats set both on cam and on assassin shows that is recording, even in the timeline. still shows real time. With the gh4 any set frame rate will only appear as 24p on the atomos. And even set up with 60p timeline everything is still in real time 24p. usually fcpx or adobe recognize the 422 codec and I don't need to convert files.. Not sure what to do. The Ninja Assassin can only record what the camera can output up to a maximum of 30fps in 4K or 120fps in 1080p. The A7S can output 1080p at 60fps and so can the GH4... neither of them can do any overcracking at 4K. 60fps will always show at realtime on your timeline as it's not conformed yet... you need to manually slow it down. In FCPX, this is just a simple task of grabbing the clip and stretching it out using the 're-time' function. The only 'conformed' slow motion option you have is the 96fps on the GH4, but this is only in 1080p and at a very low bit rate... also, it can only be captured to the camera internally, not the Assassin.